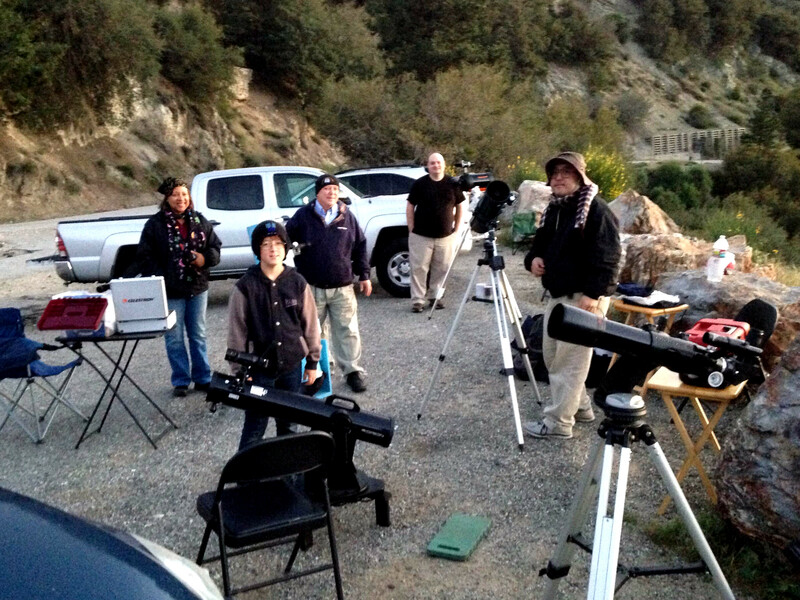 Last Saturday a bunch of us from the Pomona Valley Amateur Astronomers, plus a few folks from neighboring clubs, got together at Cow Canyon Saddle on Mount Baldy for the monthly PVAA star party. Here’s a panorama of the whole group while we were setting up before sunset. It’s worth clicking on to scan around the full-size image. I wasn’t holding a camera on a tilt, the parking lot really does slope down significantly from northeast (right) to southwest (left). I spent most of the early evening with these folks at the southwest end of things. From left to right here we have Cori Charles, our local outreach coordinator for the Planetary Society; my son, London, with his XT4.5; Gary Thompson, our club treasurer – his powder-blue 8-in Dob is mostly hidden behind London; Rob Record of the Riverside Astronomical Society with his C6 SCT; and Terry Nakazono with his StarBlast 4.5EQ. My Celestron C80ED is in the right foreground, and with Venus in the photo near the bottom of this post. 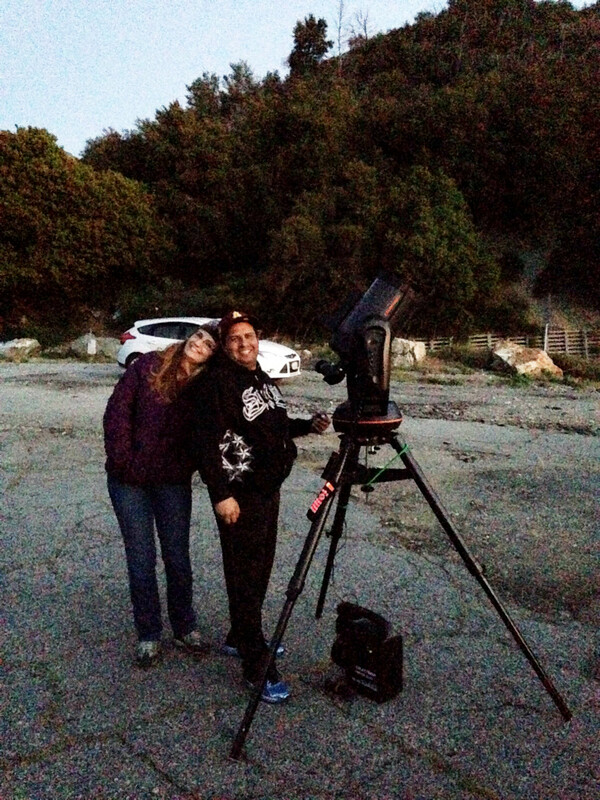 Here are Kassandra and Kevin Garcia with their 8-inch SCT – they treated all of us to a steady stream of wonderful views. Ed and Patty are relatively new to amateur astronomy and to the club, but they are getting up to speed very fast. 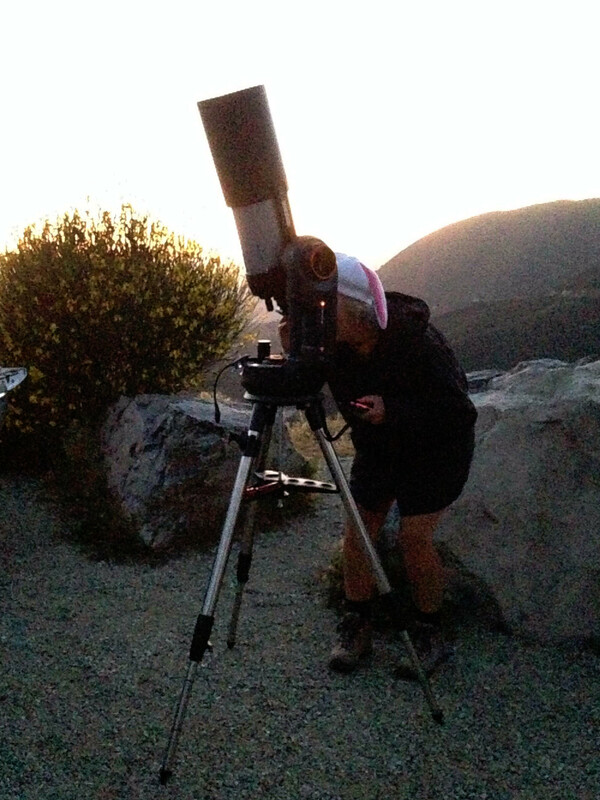 Here’s Patty looking at Jupiter through their Celestron NexStar 6 Evolution. Yes, that’s a bunny ear you can see on her hat. Ed was wearing a chicken hat, I think. I’m going to ask Patty to make me a dinosaur hat. Anyway, in the early part of the evening I split my time between socializing, looking through other people’s scopes, and helping London with a few things, although he is pretty independent with the XT4.5. He found the Orion Nebula, the Pleiades, and the Beehive (M44) all by himself, and the open cluster M41 and the galaxy pair M81/M82 with just a little help from me. I also got nice views of Jupiter through several scopes, and Brandon Finnegan treated me to great views of the Sombrero Galaxy (M104) and the triple star Beta Monoceros in his XT8. At around 10:00 I left to run London home, but I was back on the mountain by 11:00. After that, my own scope sat mostly neglected while I cadged looks off everyone else. I spent a lot of time, close to four hours, observing with Ed and Patty and their C6. I probably missed a few things, but a mostly-complete list of objects we looked at includes Comet Lovejoy – still surprisingly bright as it heads north out of the solar system – Jupiter, Saturn, M13, M5, M57, M81/M82, NGC 6543, the Leo Triplet, Epsilon Lyrae, Albireo, Polaris, M51 and NGC 5195, M4, M27, Brocchi’s Coathanger (in the finderscope of the XT4.5), Saturn again, Jupiter again, NGC 4565, and Saturn yet again to conclude. For me, the best views of the night were of globular clusters and Saturn. There was a stretch around 11:30 when most of us still on the field went a little glob-mad. I looked at M13 through both of the C6 SCTs and through Gary’s 8-inch Dob. I was extremely impressed by the 6-inch SCTs. They gave up surprisingly little to the Dob in terms of image brightness and their long focal lengths and comparatively high magnifications meant that everything we looked at had a nice image scale. All of the globs we looked at in Ed’s and Patty’s scope had nicely resolved outer halos, and NGC 6543, the Cat’s Eye Nebula, was distinctly bluish-green in the eyepiece. Then there was Saturn. Seeing was very good Saturday night and Saturn was just stunning. I have never been able to hold the Cassini Division in direct vision for so long at a time. Occasionally a random gust or roil would smear it out but it was easily visible at least 80% of the time. The disk of the planet showed salmon-colored bands, and we could make out the shadows of the rings on the planet, and of the planet on the rings, so dark and crisp they looked inked in. That’s why we kept going back for more. After Ed and Patty packed up about 3:00 AM, I wussed out and crawled in the Mazda for a couple of hours of sleep. I had a couple of quick peeks with the XT4.5 after I got up, but by then the sky was starting to get bright. Terry had pushed right through with only a half hour catnap earlier in the evening, adding 7 or 8 new objects to his tally, which now includes over 1000 unique deep-sky objects. We packed up and went down the hill for breakfast. All in all, a great time. Before the star party, someone wrote to Gary to ask if non-members are welcome at PVAA star parties. The answer is yes, always! If you are within striking distance, come on out and see some things with us. Our star party calendar and directions are available on the PVAA website, http://pvaa.us/. I hope to see you out there. You are currently browsing the 10 Minute Astronomy blog archives for the day Wednesday, April 22nd, 2015.